I grew up in Europe where my dad would take me hiking. I fell in love with the outdoors. My first visit to Colorado was a trip to Rocky Mountain National Park in 2000. I knew this was the place I wanted to call home. I moved to Colorado Springs in 2005 and immediately started exploring the local trails. I became a little frustrated by the lack of comprehensive information about the various trails so I decided to start my own list of the trails. I always carry a GPS which records my location as I hike. This allows me to create trail maps using Google Maps API. These maps offer a huge improvement in accuracy over many hand drawn maps of the local trails. Photography is another hobby of mine that combined nicely with the idea of running a hiking website. Pictures are worth a thousand words and give you a preview of what you can expect on your own adventure. The website started with just a small number of trails in 2007 but eventually grew to its present size. I have made numerous adjustments over time and hopefully increased the value of the information I present. 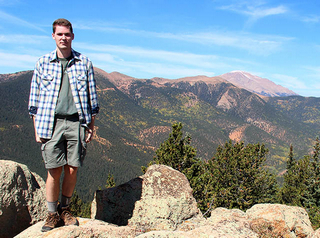 Colorado Springs Trails and Hiking is a one man project. I have hiked all the trails listed here and wrote all the text / code. Sometimes it takes a while to add new trails or make any changes but I am doing my best to keep it up to date. Please help me out by using the comments section on each page to let me know about any changes / closures and general status of the various hikes. Please let me know if you have any questions or comments. I hope you enjoy this website as much as I have enjoyed presenting this information to you.